Sow directly to the regular spot and shade. It is not demanding to grow. At least 30 cm (12 in) between rows, and put plants in a row tightly together. Thin out regularly afterwards. It can be planted among other plants, such as carrots, to soften its soil. Approx. 20 plants per person. February-April and June-mid September. It germinates in 7-10 days. In drought, water once a week to 20 cm (8 in) deep. Carrots, zucchini, melons, tomatoes, beetroot, spinach, Swiss chard, parsley, beans, peas, cress, tagetes. Especially flea beetles, when the plants are still small. Tomato repels them and can be planted between the black radish plants or used as mulch. To repel cabbage fly, plant black radish among tomatoes of pole beans, and water with tobacco infused water. Use garlic juice to strengthen the plants. It needs 90-100 days from sowing to storage. Pick regularly, before the root lignifies. Store in moist sand and it will last till spring. Use the leaves for juice and the root. It contains a lot of antioxidants and several vitamins and minerals. If you sow in early spring, cover it with garden fabric to avoid flowering. It can be planted throughout the year, but it is spicier and more prone to flea beetle attack in summer. 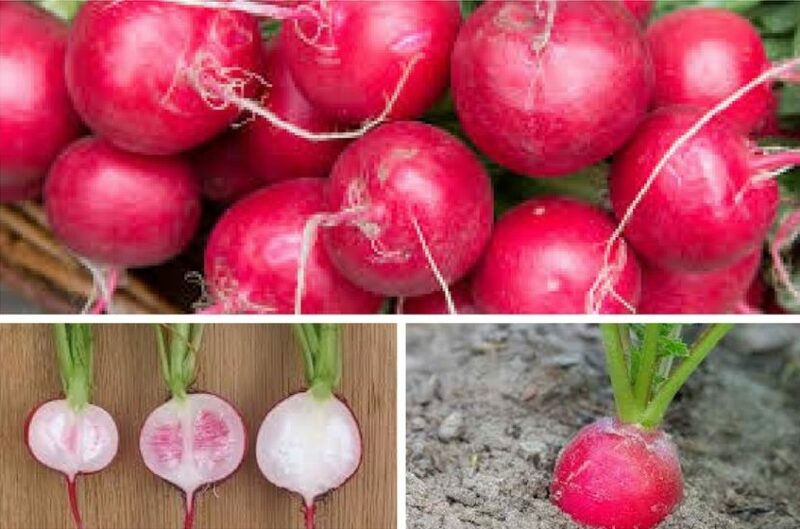 It is a smaller and faster-growing variety than the black radish. There are several sorts, varying in color, size and form.